Gallows Humor is an “Undead Gypsy Band” that was created by Mat Greaves in 2009. He developed an idea over many months to start the band, writing music and developing an act to go with it. He got his first chance as an “in-between sets” act at a Belles of Bedlam Halloween show at the Brit’s Pub & Restaurant in Pasadena, CA. Taking the persona of Romani gypsy ‘Marian Von Gogu’, Mat sang songs of necrophilia, cannibalism and drinking absinthe to the crowd, who loved every minute of it. Early versions of Gallows Humor classics “Necrodance”, “Don’t Judge Me” & “Blue” all debuted that night. Gogu (Greaves) then set out to find other like-minded musicians to flush out his undead crew. Gallows Humor went on to play the renaissance fair circuit alongside the Sportive Tricks, the Dread Crew of Oddwood, Cutthroat Reefe, Davey Tankard, Nightengale and the Belles of Bedlam. Not content to be just a ren-faire group, they also booked gigs at wine bars, restaurants and the world famous Whiskey-A-Go-Go in Los Angeles, who have asked them back to play several times. The current lineup of Gallows Humor includes Mat Greaves (‘Marian von Gogu’) vocalist, accordion, guitar, bouzouki, toy piano; Bass player extraordinaire Jules Beuck (‘Uncle Rasputin Popopovich’); Don Parrish-Bell (‘Gregor Koriatovitch’) guitar, backing vocals; percussionist Mathias Hakonan (‘Måthías Árnrunrvedr Hákonan’) who plays drums, and pounds on anything worth pounding; Patrick Palmer (‘Pitor Petrokovich’) playing concertina and vocals, as well as Ashley Nicole Biancuzzo (‘Callista Valarius’) dancing and vocals! 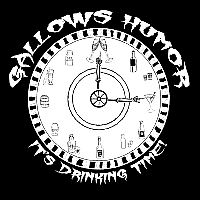 BOOKING & CONTACT INFORMATION: To book Gallows Humor for your restaurant, renaissance faire or other event, contact Mat Greaves (‘Marian von Gogu’) at Vambligon@hotmail.com for rates, availability and any other information you might need. We are currently working on our third album for all our devoted fans! Gallows Humor will be announcing all news here and through Facebook, until we gypsies can fashion a proper website. Thank you deeply for your support and encouragement ! NA ZDROVYA! Okay,this will be weird. But I know Dennis Nielsen is or used to be a part of this band. I have not been able to get hold of him since Dec. 3. His phone is no longer in service, and I am worried about him. If you see him, please let him know that Rob Izzett is worried about his well-being. Thanks so much. Hey Rob. This is Kizzy from Gallows Humor. Pavel (Dennis) is fine and back from his travels a far. I will get your message to him.